Lake Hawea lies east of Lake Wanaka, the two being formed by glacial activity over 10,000 years ago. The South Island of New Zealand was made for bicycle touring. There are few places in the world where, in relatively short distances, it’s possible to move from alpine passes to beaches glittering with surf, from rainforest to tussock plains, and ultimately to glacial lakes and fjords. 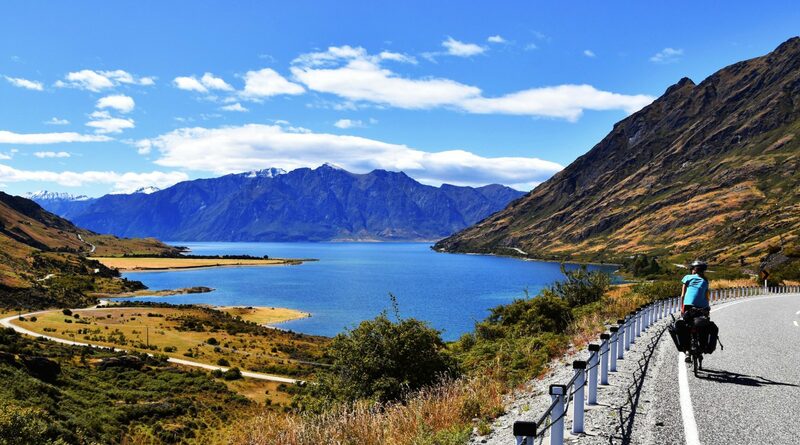 The country’s mild climate, relatively quiet roads, and rapidly expanding off-road cycle network makes bicycle touring the South Island accessible to anyone, from beginners to hardened mountain bike tourers. Below are four suggested itineraries for seeing this picturesque island, ranging from 1-2 days to 8-10 days. The river that flows through Hokitika Gorge is a captivating blue-green colour, caused by particles of mineral-rich schist rock and sandstone that are suspended in the water. Expect verdant landscapes, foothills rich in native rainforest, wild beaches bordering the Tasman Sea, a view out to Mount Cook National Park on clear days, and fewer tourists than anywhere else on the South Island. While the terrain is undulating, the hills are rarely long or steep. Bring those waterproofs: the west coast holds the title as the wettest area of New Zealand. The route follows paved roads unless taking either of the detours suggested below. Punakaiki Rocks: booming sea blowholes and rock formations that resemble pancakes. Hokitika: an artsy town with an interesting history, the main producer of indigenous jade. 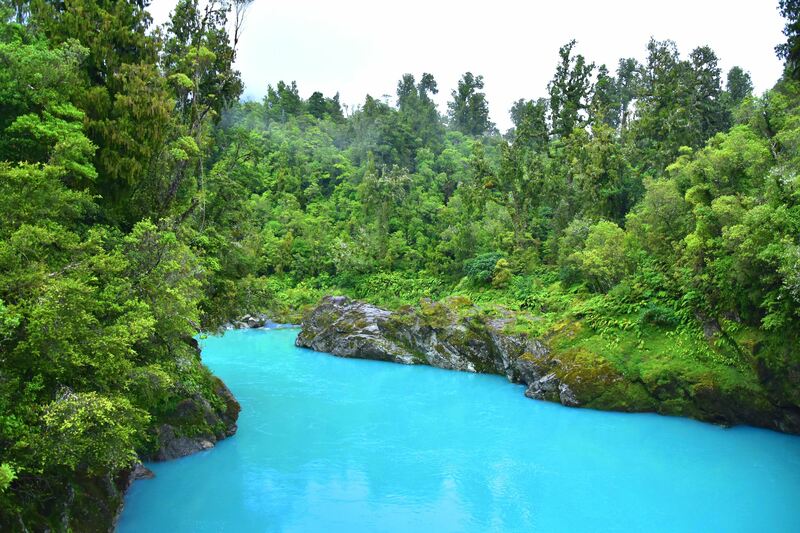 The sky-blue waters of Hokitika Gorge are worth visiting, too. Franz Josef and Fox Glaciers: take a day off to hike up to their termini, or even book a helicopter-hike through the ice caves further up. Lake Matheson: get up at dawn to take an enviable photo of the Alps reflected in the dark waters of the lake. Detour 1: The West Coast Wilderness Trail runs between Greymouth and Ross, near Hokitika. Its off-road route takes around four days to complete and is considered an easy trail. Detour 2: The Old Ghost Road cycle trail begins close to Westport and finishes at the Mokihinui River, to the north. This 85-kilometre mountain biking and hiking track follows an old gold miner’s road and is recommended only for competent and fit mountain bikers. It takes about six days to complete. Looking out across Lake Hawea towards the peaks of Mount Aspiring National Park. Route: Haast to Queenstown via the Crown Range. Expect windblown alpine passes, blue glacial rivers, mountain lakes and views that will have riders reaching for a camera every five minutes. The passes can be long and steep and the descents screaming, so a good level of fitness is required. Expect some mountain weather, but rainfall is low in the summer months. This route is completely paved, unless the two extensions suggested below are followed. Haast Pass: blue pools, thundering waterfalls and views of Mount Aspiring National Park. Wanaka: laid-back and picture-perfect, wedged between mountains and lakes. Views from the Roys Peak Track are worth the climb. Crown Range: the highest pass in New Zealand and a favourite amongst cyclists, thanks to overenthusiastic switchbacks and glorious views over Queenstown. Queenstown: beautiful and packed with endless activities for adrenaline junkies. Extension 1: From Queenstown, the 180-kilometre Around the Mountains Cycle Trail is a circuit around Taka Rā Haka Conservation Park (Eyre Mountains). The trail takes about four days to complete and finishes in Kingston, just 40 kilometres from Queenstown. Extension 2: Clyde, a town an hour’s drive from Queenstown, is the starting point of the 150-kilometre Otago Central Rail Trail. This easy, off-road route takes about four days to complete and ends in Middlemarch, a short train ride away from Dunedin. A section of the Rainbow Trail, which winds through Nelson Lakes National Park before concluding at Hanmer Springs. Route: Ship Cove, Malborough to Hanmer Springs. The first 70-kilometre section of this ride, from Ship Cove to Picton, is on the off-road Queen Charlotte Track, which traverses the spectacular Marlborough Sounds. The second 100-kilometre section, from Picton to St Arnaud, is on Highway 63, which winds through farmland and grassy plains along the Wairau River. The final 120-kilometre section, from St Arnaud to Hanmer Springs, uses the Rainbow Trail — a true wilderness cycle route with runs through the Kaikoura Mountain Range. The route features plenty of climbs, particularly in the final third. This tour is relatively remote, so it is essential to carry enough food for a couple of days and enough for water for at least a day of cycling. Recommended for more experienced bike tourers. Marlborough Sounds: a maze of forested inlets, isolated coves and sandy bays. Lake Tennyson: a high altitude lake, known for its beauty and isolation. Hanmer Springs: famous for its hot pools and mountain setting. Extension: The 64-kilometre St James Cycle Trail extends the Rainbow Trail out to the west. Only for confident, fit mountain bikers, it heads even deeper into the mountain wilderness, and adds about a day to the Rainbow Trail. Cycling the Tekapo Canal Road alongside Lake Pukaki. Route: Mount Cook Village to Twizel. 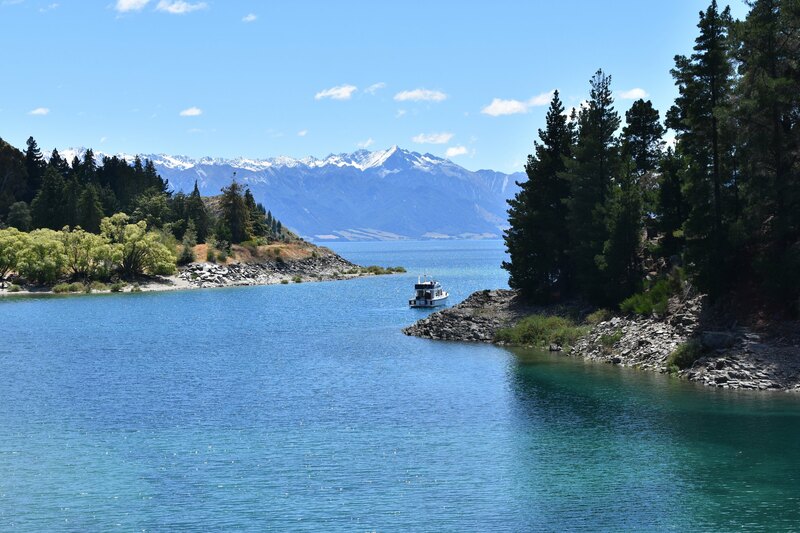 Beginning below the snowy heights of Mount Cook National Park, the world-famous ‘Alps 2 Ocean’ route descends through the foothills of the Southern Alps, winding past the River Tasman, then runs along the shores of glorious Lake Pukaki. The route is a mixture of on-road and off-road, but has few steep or long climbs. This shorter version of the trail is highly recommended for anyone trying out bike touring first the first time. Bring waterproofs and check the weather forecast for strong wind warnings. Mount Cook: New Zealand’s tallest mountain at 3572 metres. Lake Tasman: formed by the melting of the Tasman Glacier. It’s possible to kayak amongst the icebergs that have broken from the glacier terminus and are drifting in the lake. 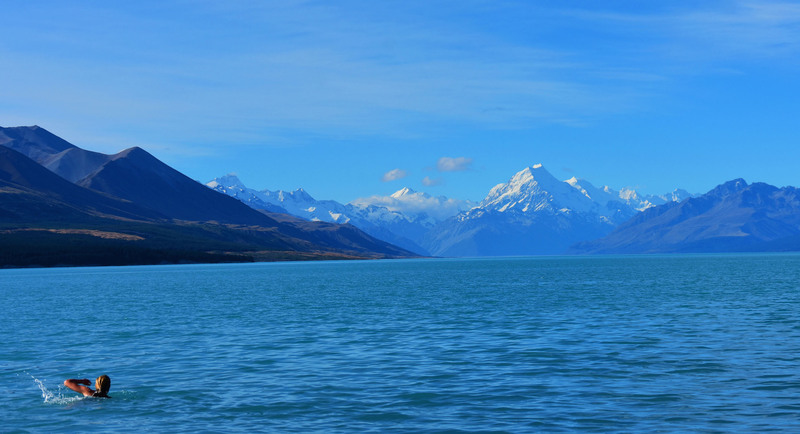 Lake Pukaki: Famous for its vibrant blue colour, and for views of Mount Cook on clear days. Extension: The original ‘Alps 2 Ocean’ cycle route continues southeast for another 200 kilometres towards Oamaru on the Pacific Coast. The best weather in the South Island is in the summer and early autumn, from January to late April. Summer will see the better weather, but autumn has the bonus of fall colours and the first snows on the mountains. Expect rain at any time, though, especially in the mountains and on the west coast. The twin vistas of Lake Pukaki and Mount Cook, which shows a light dusting of late summer snow. There are so many possible itineraries for the South Island, which vary in terrain, distance and difficulty, that there are many touring routes for people with reasonable fitness. That said, it is important for each rider to ride to their ability and to take into account the potential fitness of all the riders in the group. 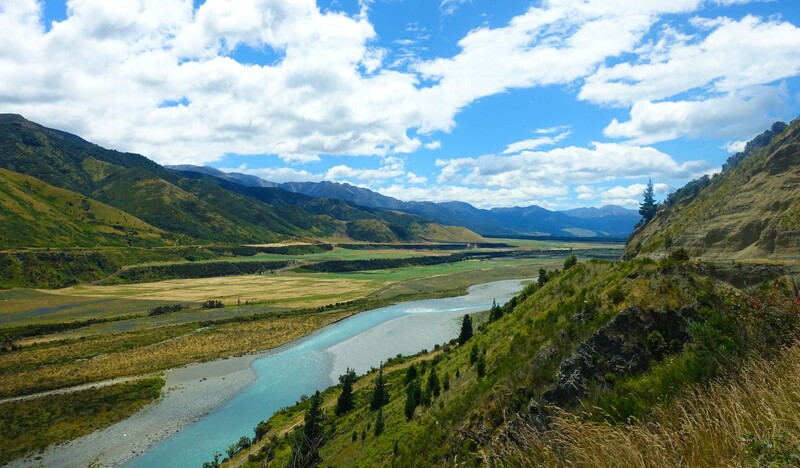 Camping is the easiest and cheapest accommodation option considering the wide-open spaces of much of the South Island. Excellent Department of Conservation (DOC) campsites exist throughout New Zealand. These only provide basic facilities, but allow campers to stay in some truly isolated and scenic locations. Additionally, there are plenty of commercial campsites that generally provide more extensive facilities. Apps such Rankers Camping NZ are invaluable for finding quality tent camping throughout New Zealand. In larger towns there is the option of staying in backpacker hostels or motels. Hiring bicycles: New Zealand has a good choice of bike hire companies. 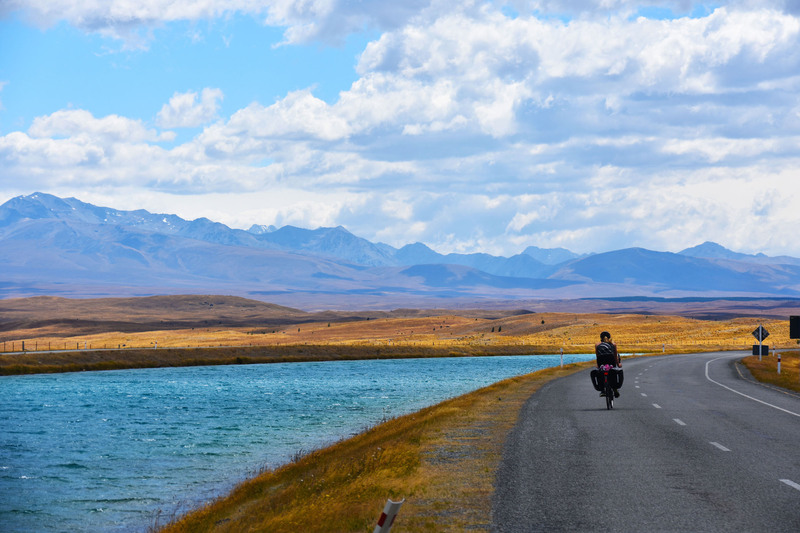 Specific cycle touring companies are usually a safe bet for quality touring or mountain bikes, with panniers and other equipment usually also available for hire. Some hire companies can also arrange shuttles and accommodation. Be sure to call ahead to reserve a bike during the busy summer months. Owned bicycles: Flying with a bicycle is easier and cheaper than one might expect. Consider this option if aiming to complete a longer bike tour. Look at the appropriate airline’s oversize baggage policy for guidance on how to pack up the bike. Be prepared to remove the pedals, wheels and seat, and detach the handlebars from the headset if required. The bikes should generally be in a cardboard or hard-shell box; cardboard bike boxes are available free from any bike shop. Camping: Department of Conservation campsites generally have pretty basic facilities so be sure to carry portable chargers for phones and cameras. It is usually not necessary to book ahead at campsites. The exception to this is in Queenstown, where campsites close to the town centre can get very busy. 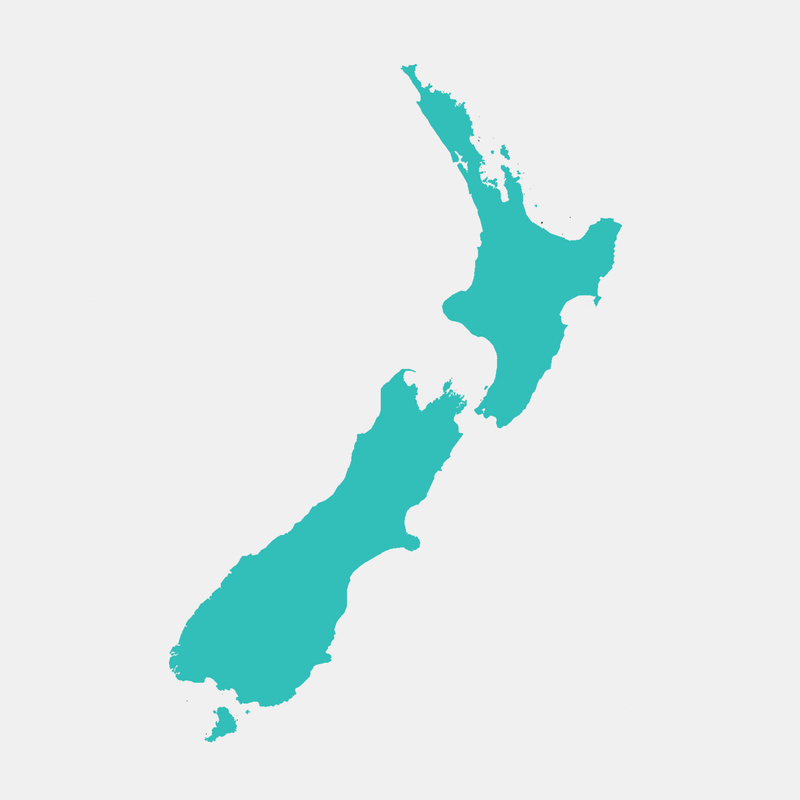 Navigation: A good map — paper copy or digital — of the area being visited is necessary, as mobile coverage can be patchy at best in the South Island. The named off-road cycle routes described in the itineraries above are part of the government’s New Zealand Cycle Trail initiative; consult the website for more detailed trail information. Getting around: Between larger cities, several coach companies, such as Intercity Coaches, can accommodate bicycles — always call ahead to book a bicycle space. Between smaller towns, one may need to organise private shuttles. Local i-SITE tourist offices are extremely useful in providing information on shuttle services in the area. Provisions: Be sure to carry plenty of food and water for each day of cycling, as food stores and cafes are often limited en route.